Mr. Hakeem said the talks with the LTTE leader were friendly and productive. The three and a half hours of discussion centred around several problems faced by Muslims in the Northeast, he said. 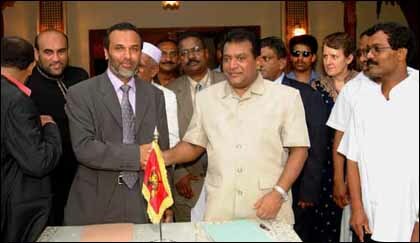 "A joint committee comprising representatives of LTTE and SLMC would be appointed to co-ordinate affairs related to the return of displaced Jaffna Muslims to their own homes," Mr. Hakeem, a Minister in Sri Lanka's government told reporters at a press conference in Colombo, on his return from Killinochchi Saturday night. "Mr Pirapaharan has agreed to invite all displaced Muslims to return to their own places in the northeast," Mr. Hakeem said. Likewise, it was decided that a suitable environment should be created for people displaced from villages in the east to resettle in their homes, SLMC sources said. "As a result of Saturday's talks, solutions to several problems faced by Muslims have been found," Mr. Hakeem said. "This will calm the apprehension among our [Muslim] people about the peace process." "Mr.Pirapaharan and myself have signed a joint statement regarding the return of the displaced Muslims. It has been agreed to appoint a joint committee consisting LTTE and SLMC representatives to facilitate the process of resettling the displaced Muslims," Mr. Hakeem said. It was also decided at the discussion that any negotiations that have a bearing on Muslims would have the participation of the SLMC, he said. Mr. Pirapaharan was assisted by Mr.Anton Balasingham, the LTTE's political advisor, Mr. S. P. Thamilchelvan, head of the movement's political wing. Col. Karuna and Col. Pathuman, the LTTE's military commanders for the Batticaloa-Amparai and Trincomalee respectively. The SLMC delegation comprised Ministers Noordeen Mashoor, A.L.M.Athaullah, Deputy Ministers Basheer Segu Dawood and Mohamed Abdul Cader and senior members Mashoor Mowlana and Uduman Lebbe. The SLMC-LTTE agreement says that cultivation by Muslims in untended Muslim lands in the North and East would be enabled. The practice of collecting funds from Muslims in the East would cease, SLMC sources said. A representative from SLMC will be appointed to enhance Tamil-Muslim relations in the districts of North and East and to liaise with LTTE senior commanders with respect to difficulties faced by Muslim people resident there. 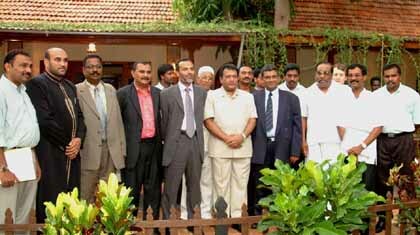 Top-level meetings between the SLMC and the LTTE will continue in the future to approach the basic political problems of the Muslims in the North and East and to maintain their unique political and cultural identity. On being asked about possible opposition within Muslim quarters, in reference to the National Unity Alliance of Mrs. Feiral Ashraff, Mr. Hakeem said "we have not conceded or omitted anything to warrant any opposition. LTTE have given favourable answers to questions and concerns raised by us."